It looks like the B&N leaks are coming fast and furious. On Monday we're going to see Barnes & Noble finally respond to the $79 (ad-supported) Kindle. 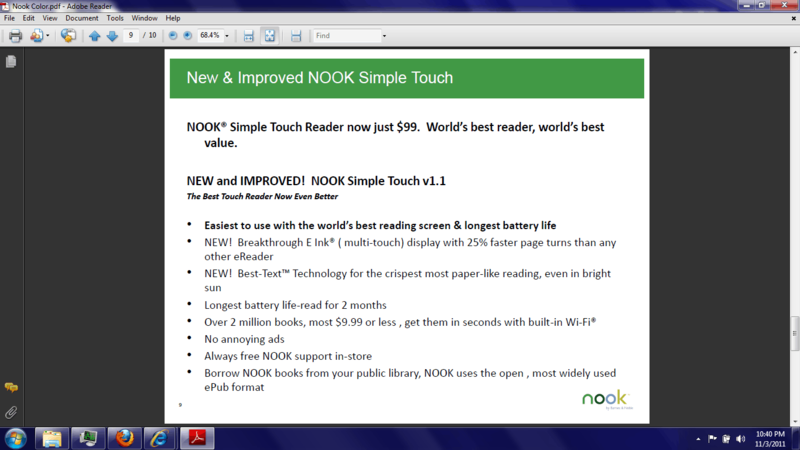 According to a leaked doc, the Nook Touch is getting a price cut. It might also be getting a hardware update, but I haven't seen anything pass through the FCC (though that could happen after the press conference). 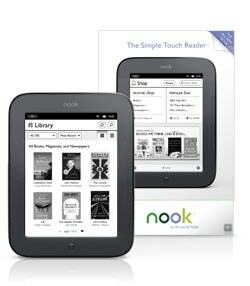 The Nook Touch is going to cost $99, or $10 less than the retail price for the K4. That's gotta hurt. The NT has better specs than the K4, and while I would think the old $139 price was at least break even, the new $99 price is probably a money loser. I'm not sure yet whether the details in this doc are marketing BS or actual technical details for a new Nook. I'm waiting until Monday before I say anything for sure. I wonder how B&N plan to respond to all the people that they sold the refurbished models to for $80? That's not the good deal that it was yesterday. New Kindle Fire to Have 8.9″ Screen? Amazon.com won’t do ANYTHING!, because most people don’t mind the ads. Some think they’re a plus. Nothing is one option but not the only one. Cue Taps for Sony Reader. B&N is playing for keeps. Sony never has been. Yep, and it’s a pity. The Sony Reader Wifi is the better device. Integrated library support, multi-level table-of-contents, collections (that sync), and zooming on images that were scaled down to fit on the page … Sony seems to be light years ahead in stuff that matters to me. >>>The Sony Reader Wifi is the better device. Sony apparently can’t do a damned thing right anymore. I’ve never seen that redraw problem, and since it runs the Sony, Kindle, and coolreader apps I am good to go (for reading apps, at least). I like the general hardware feel, too. Aside from price, I don’t see the Sony as a bad product. And Sony is still pretty popular in Japan and Europe where the competition isn’t as crazy. The level of competition domestically is driving even Amazon to lose money. I can’t blame Sony for backing off in this particular market. is it a good buy then? the $99 nook touch or the new kindle touch? It depends on your preferences: do you care about epub support? Do you have a use for digital audiobooks, mp3 playback while you read? I wouldn’t write Sony off just yet. I’ve been wondering too and now I must lean towards software. Because a straight hardware revision would not just be expensive, it’d confuse the hell out of the resale market and also piss off current owners. Right, the Kindle 4 Touch is $99 with ads and some ‘special offers’ that many seem to like. But it also is able to zoom images to the full size of the screen (as can every Kindle, including Kindle 1,) something my NookColor cannot do, which is frustrating to me in art or history books), and which the Nook can’t. I’ve heard that was an Adobe limitation somehow in connection w/ ePub though I don’t understand how. The Kindle has a WORKING web browser (not one that needs to be hidden for good reason), said to be quite fast for e-Ink, has audio and speakers for an mp3 player, has Text-to-Speech, and the vaunted X-ray feature (with a tap, “see all the passages across a book that mention ideas, fictional characters, historical ifgures, places or topics that interest…as well as more detailed descriptions from Wikipedia and Shelfari [that’s built in and downloaded w/ the Kindle book). Also, The Kindle comes with a private, password-protected webpage for your annotations, by book, printable and transferrable to the computer. Also, besides the 5 gigs of storage for any type of file that Amazon gives each customer (and unlimited free storage for Amazon-purchased media), globally, Kindle customers now also have another free 5 gigs for personal documents for the Kindle, including non-DRM’d books from another website. We’re not talking equal things when comparing $99 to $99, on top of the ads or special offers. Yes, the Kindle Touch has all those extra features your mention. But are those features used by most readers that buy their Kindle just to read novels, or needed by those readers, I personally do not think so. As for storage. Alle media you buy at B&N are stored at B&N in your B&N library, unlimited, for free. And for storage of personal files you can add an SD-card to you Nook Touch which will give you up to 32GB storage, not in the cloud but always available to you. As of the zoom thing. I believe that is indeed an ePub restriction. I do not know is this was solved in the new ePub3 standard. It is not a limitation of the standard or Adobe. Aldiko used to support this feature and the newest Sony just added it. You already identified the problem: much like multi-level table-of-contents, novels don’t really need the zoom feature so it gets left out. The best kind of competition is when products are comparable but different so we get a choice. And that is where we stand today: at US$99 and thereabouts we have 5 quality choices for new hardware, each with its pluses and minuses, with (maybe) more to come. None is a bad choice, none is perfect. All involve trade-offs so choosing one is a function of personal preference and needs. Whether you prefer a touchscreen to paging buttons, or whether a decent open broser, audio ebooks and TTS, ST card expansion, cloud storage and services, or android hack-ability are important will be a personal, subjective matter just as whether the ads are a desirable feature or not. Everybody has their own idea of what is best for them, an idea which won’t necessarily match anybody else’s. And doesn’t have to. That’s why we want choices. 1- What price will B&N be paying to hit this aggressive new price point? 2- Will other epub reader vendors cut their prices, too? 3- If other players don’t follow suit, will they remain relevant? Looking at all the combined moves we’re seeing I’m getting an endgame vibe, the impression that come next spring we’re going to be looking at a very diferent competitive landscape. B&N may or not be aiming their moves solely at Kindle, but they are definitely hitting the other epub players right wher they hurt.